The American Museum of Fly Fishing and Johnny Morris' Wonders of Wildlife aquarium and museum in Springfield, Mo., will give curious anglers the chance to walk under a carefully crafted trout stream and see how trout move about the water column thanks to a new partnership between two entities. In addition, a large portion of the AMFF's fly-fishing collection will go on display at the Wonders of Wildlife exhibit. The potential to reach a significantly wider audience and inspire new generations to discover the sport was a key motivation in the AMFF's decision to form a partnership with Wonders of Wildlife. Located in the heartland of America within a day’s drive for half the population, Wonders of Wildlife welcomed 1.6 million visitors in its first year alone (2017) and has been voted as “America’s Best Aquarium” and “America’s Best New Attraciton” by USA TODAY readers. 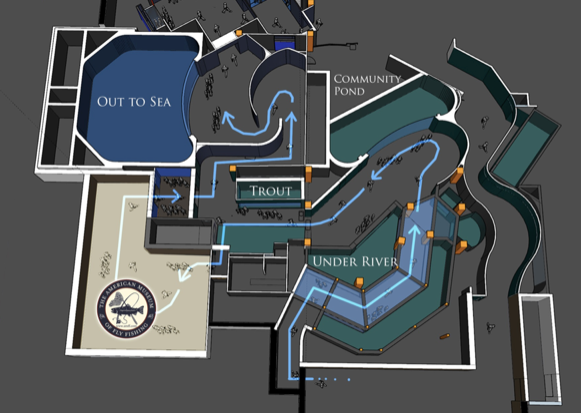 The on-site trout stream will be just one of several features. The American Museum of Fly Fishing will continue to operate out of its Manchester, Vermont, location, offering onsite and traveling exhibitions, educational programming, access to the Gardner L. Grant fly fishing library, and production of the American Fly Fisher journal (one of the greatest benefits of AMFF membership). AMFF will also continue to present the annual Heritage and Izaak Walton Awards, and remain stewards of the sport through collecting, preserving, exhibiting, studying, and interpreting its artifacts, art, and literature.